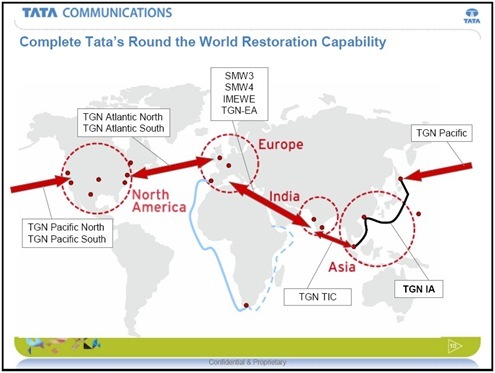 Tata Communications has partnerships with a consortium of cable operators, including SEA-ME-WE 4, C2C, SAFE, EAC, APCN-2, Americas 2, CANTAT 3, 121 and others. The Company has alliances with BT, C&W, France Telecom, T-System, Telecom Italia, AT&T, Verizon Business, Sprint, SingTel, NTT, Telstra, KDDI, Telecom Malaysia and many more. Presently, Tata Communications has total lit capacity of over 2 terabyte and is the world’s largest carrier of voice traffic. Tyco: Acquired in 2005, the company was one of the largest owners of submarine cable bandwidth. Teleglobe: Acquired in 2006, this global wholesale provider helped Tata Communications become the owner of a Tier-1 IP network. Neotel: The second largest service provider in South Africa. By year end, Tata Communications will be the first to have undersea cable network around the world in the form of a ring. Here is a sketch from Tata Communications showing worldwide presence. Read more from Tata Group – Tata Communications.